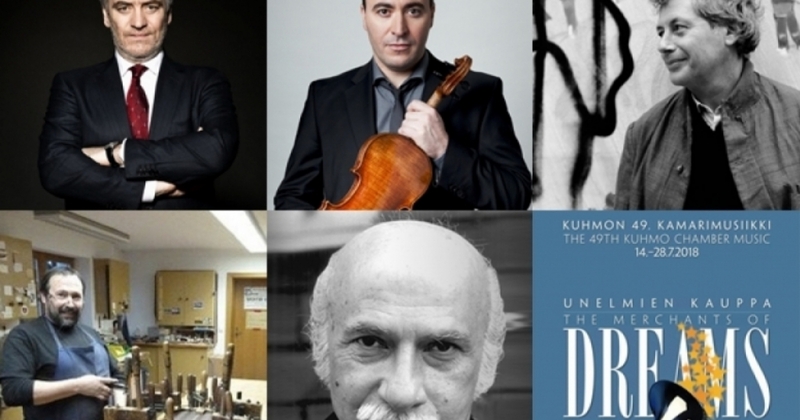 The names of the winners of the 2018 Cremona Musica Awards represent the true excellence in music: the conductor Valery Gergiev, the violinist Maxim Vengerov, the writer Alessandro Baricco, the guitar luthier Hermann Hauser III and the Kuhmo Chamber Music Festival will be awarded this September. The Cremona Musica Award in the category “Performance – string instruments” to the violinist Maxim Vengerov. Recently, Vengerov made a really successful comeback in concert, after some years of absence, showing an interpretative intensity and a poetic that might be compared only with the great violinists of the past. Mo. Maxim Vengerov will perform in recital at the Stradivari Festival, Fondazione Museo del Violino Antonio Stradivari, on October 6th. The concert will take place at Auditorium Giovanni Arvedi accompanied on the piano by Roustem Saitkoulov. Cremona Musica Award in the category “Communication” to the Italian writer Alessandro Baricco, whose activity has been influenced by his love for music, as in his essays on Rossini (Il genio in fuga. Due saggi sul teatro musicale di Gioacchino Rossini) and in the monologue Novecento, that inspired Tornatore’s movie The Legend of 1900 (“La leggenda del pianista sull’oceano”). Baricco was also able to communicate the poetic and semantic contents of music in a direct and engaging way during his TV and Radio shows. Cremona Musica Awards in the category “Projects” to the Kuhmo Chamber Music Festival. This Finnish chamber music festival, whose 49th edition is being held between 14 and 28 July, gathers every year about 35.000 listeners from all around the world in the city of Kuhmo (9000 inhabitants, 600 km north from Helsinki), for a great music full immersion. What makes this festival unique is the format: about 100 concerts in 15 days, with programmes that mix extremely rare and well-known music, famous musicians and rising stars, with an informal approach, far from the stereotypes of the star system. The Kuhmo Festival is an innovative and virtuous example, that works also from a productive and economic point of view, thanks to the enthusiasm of the musicians that enliven the festival, being its heart and soul. The award will be collected by Vladimir Mendelssohn, artistic director of the festival. In this edition, the awards are one-off sculptures made by the artist M'horo for the collection “M’horò Suite. Sculptures… for orchestra”.